Spinosaurs had widely spaced teeth in seperate sockets like crocodyliformes. So unlike other theropods they may have been lipless with the teeth exposed. They were semiaquatic like hippos but with no obvious adaptations for swimming. They shared ancestory with the Jurassic meglasaurs. The large adults would not have been limited to fish but would have included carrion, pterosaurs and active hunting of herbivores. Large plant eating are rare implying an eco system centered around the rivers. 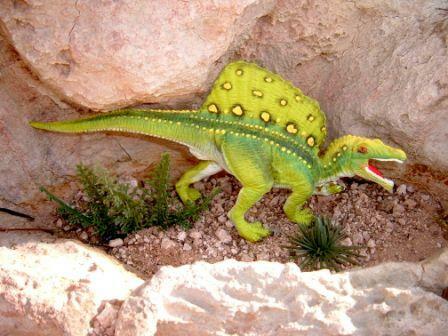 Spinosaurs were long bodied with a long shallow head. The snout long and narrow. The teeth are conical and twice the number of other theropods. We now know that the bipedal posture and plantigrade use of the hands is not supported by the most recent fossils. The back linbs were possibly webbed. 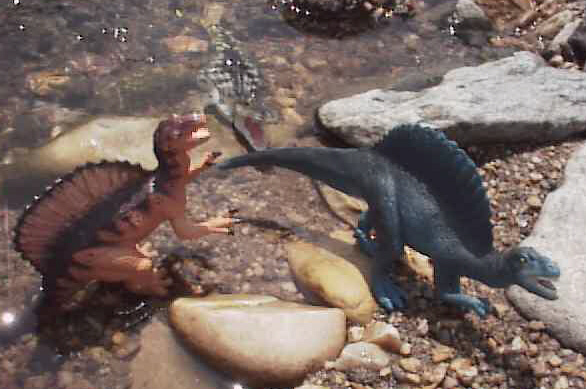 Spinosaurs are found along water courses and coastlines in Gondwana and Europe. The are not present in North America.